At Wofford College we had two ASR-33 teletypes. These terminals came out in the 1960s and served multiple purposes. You could use them as an uppercase-only printing terminal. They also had paper tape reader/punch units, which allowed us to have a means of offline storage. They were mechanical and very noisy and loud. 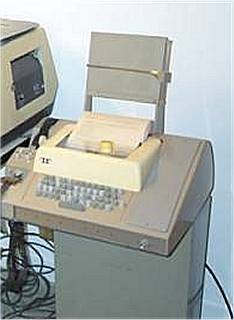 I have one functional ASR-33 teletype connected to the PDP-11/40 as part of the Wofford Witch environment. It has been used to read and punch paper tapes, and it works well. It is currently connected via a 20mA interface on the M7814 DZ-11 multiplexer.